We are proud to support three new symposia organized by student and postdoctoral members of the GSA! The goal of the GSA Trainee-Organized Symposia program is to empower our early career members to organize local events that enhance the professional development of their peers, including career skills symposia, networking events, and scientific symposia with substantial opportunities for student and postdoc presenters. Read more below about the recipients of the Spring 2017 round of funding: the Bay Area Worm Meeting, Cracking the Repetitive DNA Code, and Toronto RNA Enthusiasts Day. Proposed workshops were evaluated by the Society’s Mentoring and Professional Development Committee based on their relevance to the GSA mission, the need for and the uniqueness of the event, the benefit to early career geneticists, and the availability of other relevant support. We encourage other early career members to come up with new and valuable events! The next round of proposals is due July 10, 2017. From left to right: Jacqueline Lo, Mark McCormick, T Harshani Peiris. The Bay Area Worm Meeting (BAWM) is a trainee-organized event designed to advance research, foster interactions, and maximize career development opportunities for the local C. elegans community in the San Francisco Bay Area. This one-day meeting attracts C. elegans researchers from across the Bay Area, including the campuses of UC Berkeley, Stanford, UCSF, UC Davis, UC Santa Cruz, San Jose State, San Francisco State, CSU Sacramento, CSU East Bay, Santa Clara University, Mills College, and the Buck Institute. The focus of the meeting is for trainees who use C. elegans as a model organism to share their research and advancements in new techniques and tool development with the local community. The BAWM also aims to foster interactions between institutions, allowing attendees to communicate face-to-face to share their research, form collaborations, and facilitate reagent sharing. This meeting allows trainees at various stages of their careers to present and discuss their research in a supportive and encouraging environment. 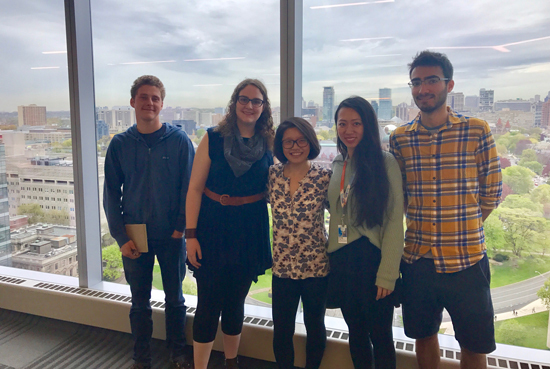 At this year’s meeting (held May 6, 2017), we included a new event where trainees had the opportunity to have lunch with faculty members in small groups to talk and ask questions about career paths in science. From left to right: Sarah Deng, Stephanie Lauer, Andres Mansisidor, Danni Wang. TREnD 2017 is a student-led and trainee-focused event that seeks to create a scientific forum for RNA researchers in the Greater Toronto Area. It addresses the strong desire among our RNA biologists to increase communication, build cross-disciplinary collaborations, and strengthen the scientific community. We aim to bring together diverse scientists focused on classical genetics and high-throughput genomic approaches to spark exciting new collaborations. TREnD2017’s keynote address will be presented by Dr. Phillip Zamore (University of Massachusetts Medical School), followed by talks and posters from postdoctoral, graduate, and undergraduate trainees whose research lies within the broad field of RNA biology and genetics. We are excited to see what everyone has been working on, and we hope that you will join us! For more information and to register see https://trendrna.com.